IMPORTANT NOTE: As the diagnostic and reprogramming software applications have evolved, the requirements for additional computer storage capacity and memory has increased. Please review these computer specifications carefully and take any necessary steps to update your hardware as needed. * Laptops purchased from Detroit Diesel beginning in August 2006 meet the minimum specifications. Any purchase prior to this time may need to be upgraded. As of May 1, 2011, Detroit Diesel discontinued offering the Dell Laptop. 1 - For DDDL 7.10 the only translator box fully validated with Detroit Diesel software applications is the Nexiq USB Link, which is RP1210A compliant with J1939 and CAN connectivity. (P/N 125032) Translators that support J-1708 communicationosn ly will not work with DDDL 7.10 under any circumstances. 2 - All EPA07 vehicles contain a 9-pin Deutsch connector wired to support J-1939/ CAN communications and J-1708 communications. EPA10 vehicles support J1939/CAN exclusively. 3 - All operations may be carried out on a vehicle that has both the MCM and CPC properly installedN. ote: There must be a CPC physically present on the vehicle in order for communications to be established with the MCM. 4 - When plugging into the 9 pin Deutsch connector on the vehicle you mu sutse a mating 9-pin connector fully wired to support J-1939 / CAN communications. The old style 6 to 9-pin Deutsch adapter will not work. 5 - Diagnostic adapters that will work with the DDEC VI/DDEC10 system include P/N 405048 (6 and 9-pin ¡§Y¡¨ adapter) and P/N J-46931, the J1939 9-pin Deutsch Connector that was part of the DDEC V programming station upgrade kit. 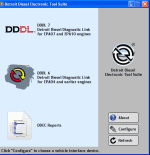 Before installing DDDL 7.10 you must remove any version of Detroit Diesel¡¦s software to minimize the chance of any conflicts with older versions of the software. Please use the Windows Control Panel¡¦s ¡§Add / Remove Software¡¨ option to perform this operation.
. DDDL 6.50 cannot be used unless DDDL 7.10 is installed and registered on the same computer. These will be required for major changes to the program such as changes to the graphical user interface. These updates are initiated from within the DDDL software application. An internet connection is required to use this feature. 2) The license panel will appear with displaying your computer ID. Each computer ID is unique to the computer DDDL is loaded on. NOTE: This computer ID is an example only and cannot be used to register your software. To register Diagnostic Link 7.10/6.50, contact the Nexiq Support Center a1t -877-974-3539 with 2 pieces of information, the computer ID as shown in the picture immediately above and the numbered label on the back of the CD caseI. n ternational customers can contact Nexiq at 1-248-293-8285. The Nexiq Support Center also provides basic support for DDDL 7.10/6.50 relating to installation and connectivity issues. VII. - DDEC Reports 8.02 - DDEC reports is not installed with any version of Diagnostic Link, but is available on this CD at no additional charge. This version of DDEC Reports supportsa ll current production engines platforms . No registration is required. When viewing the standard trip reports, users will notice that several new terms have been added that only apply to DDEC VI and DDEC10 equipped vehicles. An updated glossary of terms used in DDEC Reports can be found in the DDEC Reports help file or by printing out the DDEC Reports Glossary from the CD menu. DDEC Reports 8.02 uses both J-1708 and CAN messaging for communicating with the vehicle. You will connect through the vehicle¡¦s 9-pin diagnostic connector to extract data. All the translators that are designated to work with DDDL 7.10 in an earlier section of this document may be used for DDEC Reports extractions as well. В данном случае пароль 0000, т.е. блок не запаролен так как этот пароль по умолчанию на всех движках.